This PDF 1.5 document has been generated by Microsoft® Office Word 2007, and has been sent on pdf-archive.com on 24/04/2013 at 23:03, from IP address 216.255.x.x. The current document download page has been viewed 730 times. File size: 994 KB (33 pages). Delphi site used for this study. established, and appropriate and established research methods were selected. learning principles were revised again. were asked to list one or more instructional methods that apply an agreedupon adult learning principle to Web instruction or training for adults. deviation, skewness index, interquartile range, and rank to indicate consensus. familiarity with instructional methods appropriate for delivery by the Web. Table I.
outlines the procedure used to select the Delphi expert panel members. (1995) suggests ten participants to be the minimum. reminders in order to gain a higher level of participation. (Turoff &amp; Hiltz, 1995, p.8, p.11). dissertation chair, including photos (not shown). Figure 2. Home page of the web site. navigation menus, short biographies of the researchers, and information on the study. 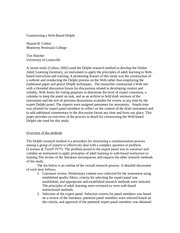 dissertation title link and the dissertation method link. Figure 3. Dissertation topic screen. The dissertation topic screen is embedded in the home page. Figure 4. Delphi method screen. The Delphi research method screen is also embedded in the home page. e-mail addresses which would compromise anonymity. The following is a screen capture of the assignments page. various tasks as they are assigned. discussion at any time and in any place with a computer and an Internet connection. Appendix D: Delphi discussion, comments, and correspondence. The following two figures display two views for accessing the discussion forum. second view (Figure 8) displays topics by thread. Figure 8. Threaded discussion topics. researcher, to focus the discussion into the threads. Figure 9. Sample discussion thread. option to read any one posting or to read the entire thread. the voting ballot, correspondence, and references from the literature where necessary. contribute to the problem solving process” (p. 2). 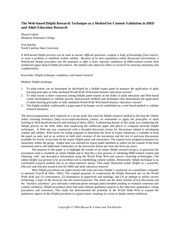 study in order to reduce bias and promote participation. pennames and the actual names of panel members were not linked for identification. by e-mail to the panel members’ computers. and as identified in the literature. instrument was decided upon by vote of the expert panel. completed prior to the initiation of the Delphi process. 1975, Dobbins, 1999) (see Review for Readability in the Instrument section for details). The next section describes the Delphi process used in the present study. 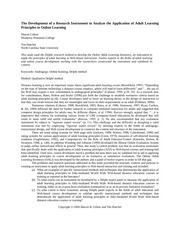 adult learning principles (draft #2) and a vote was taken to end the round. instruments) were posted on the discussion forum and sent to each participant by e-mail. Instructions to expert panel members. displayed by figures 10 and 11. Specific directions were posted in the discussion forum for each task to be completed. Figure 11. Website directions for task 2. This figure displays the detailed directions for task #2.
entering the forum area (see Figure 12). Figure 12. Website directions for using the discussion forum. discussion forum and has a review of the anonymity policy of the study. screen capture of the website instructions for task #3, vote 1. Voting Form attached to the above page. the voting ballot for vote 1.
named Athena, is then sent to the researcher’s America Online account as shown above. Note in the figure below that the sender was the University of Louisville Athena server. adult learning principles from round one, then vote on the list. The vote ended the round. Appendix A for item pool examples from the literature). (task #4) were posted to the Delphi website as was the latest draft instrument (draft #3). The directions are a step-by-step procedure for completing task 4.
time for final item selection. It was the time for compiling and sorting the item pool. 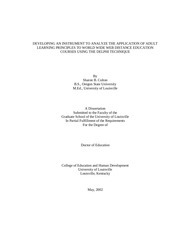 instrument drafts #4 and #5.
and their application to or facilitation of adult learning principles in a Web-based course. applies, and to vote on the result, setting the stage for further discussion and round three. were asked to read and reflect upon the draft instrument and its components. This set of directions is to aid in completing task 5.
expert panel members. Figure 18 below shows the website directions for vote 2.
panel members. Anonymity will no longer be required. button to automatically e-mail the completed ballot to the researcher. expert panel members. Web-site directions for the panel are shown in Figure 19 below. statements value free and clearly defined (Webber, 1995). incentive for most of the panel members. instrument can also be used as an evaluative tool for educators and researchers. be more cost-effective, more efficient, and more reliable than multiple score rating scales. Academic Library World Wide Web Sites (Stover, 1997). than multiple score rating scales. they are more economical to construct (Aiken, 1996). cultural and gender bias (University of Arizona, 2000). Chao &amp; Dugger (1996), Jackson (1998), Ryan, Carlton, &amp; Ali (1999). Committees, 2001) was completed prior to the initiation of the field test. was obtained from the course developer to use the Web course for the field test. reliability, a standard type of reliability evidence for binary checklists (Aiken, 1996, pp. internal consistency reliability coefficient. The expected range is from zero to 1.0.
with bias present (1993, p.144). computer lab; the researcher adult learning principles. each item the same as everyone else. that were answered for the benefit of the group as a whole. test, the instrument was revised. An indication of reliability was assigned. 1997, Friebel, 1999) but none were identified that used a Web-based Delphi. validation of content than the traditional paper-based Delphis? Gunning Fog Index (1983) for readability was calculated. This file has been shared by a user of PDF Archive. Document ID: 00101629.